of 40 ready graphic templates. 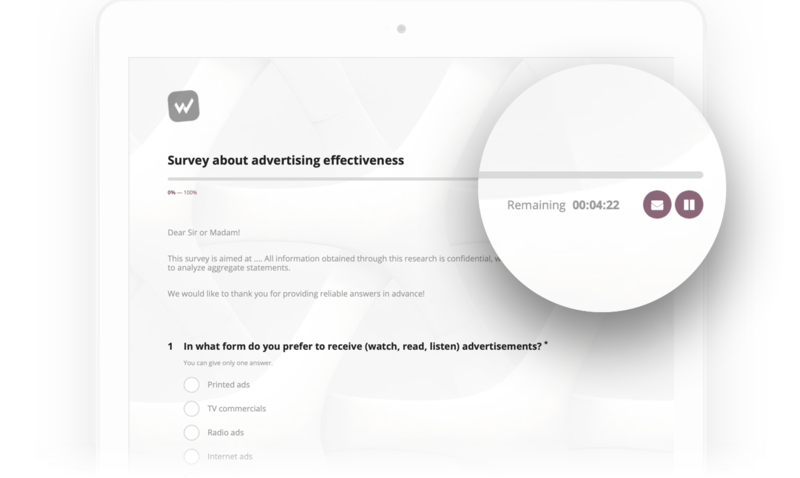 High level of personalization of the survey design - content of questions, answers, title, progress bar, background photo, frames, buttons, messages. In addition, there are almost 40 ready graphic templates to choose from. Insert the logotype of your company, brand or project into the questionnaire so that the respondents would immediately associate the received research with you and approach it with greater confidence. 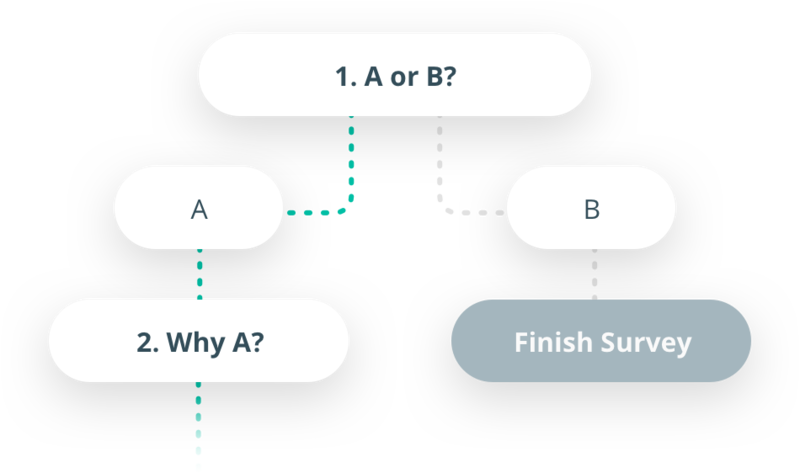 Selection of mandatory questions, the order in which the answers are displayed, the minimum and maximum number of responses given, linking questions with previous choices. Ask the respondent questions which are appropriate in his situation by applying filter questions. You can also display subsequent pages of the survey depending on the answers you have provided previously. 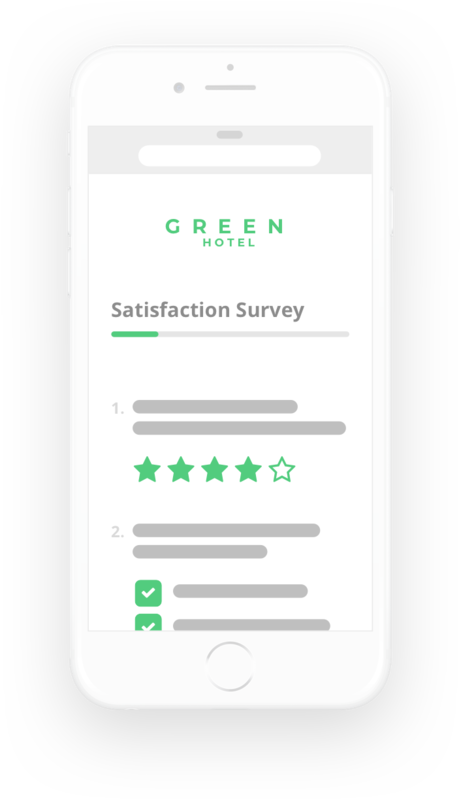 Sometimes we don't want to boast of the fact that we use external solutions, so you have the opportunity to use the external domain of the survey and hide the footer of the questionnaire with information that the survey was created in the Startquestion platform. Collect data in a simple way by sending invitations to the email or by pasting the survey onto the website. Invitations to fill in the questionnaire can be sent to an e-mail address, which allows you to quickly reach large groups of recipients. The status of your shipment can be tracked from your account. You don't need to send links and share the survey by e-mail - you can view it on the website. The questionnaire may appear immediately after entry or at a specified time. Access to the account on the Startquestion platform is possible 24/7. At any time, you can follow live results, change settings, create reports and analyze data. The survey can be available to respondents at the same time or sent gradually to selected people. You decide who and when will receive the invitation in your account settings. Sometimes, one e-mail with a survey is not enough. Therefore, Startquestion allows you to automatically send reminders to those who did not complete the survey despite they get an invitation. An invitation to complete the questionnaire can be permanently visible on the selected website. Attaching it to the edge of the browser will make it visible everywhere. 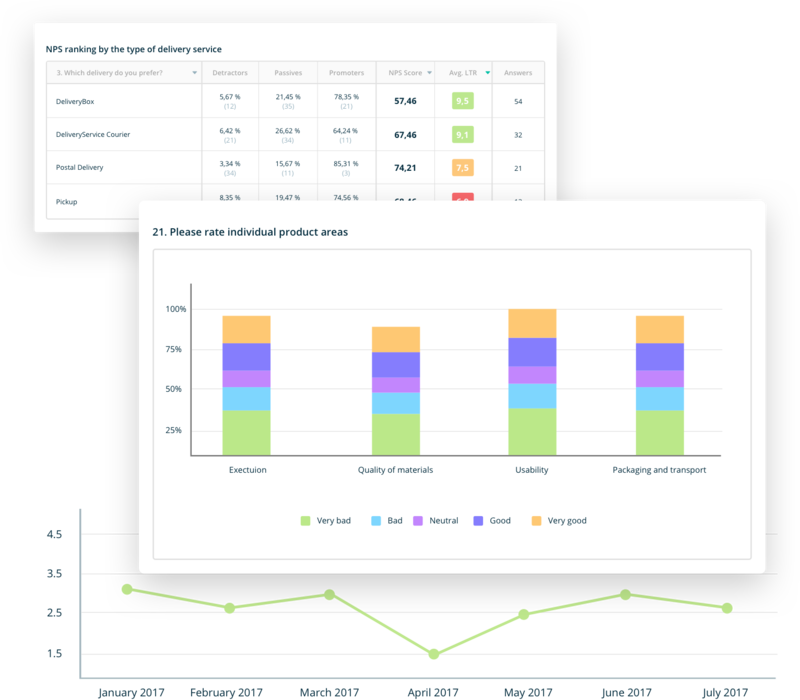 create a beautiful report with the presentation of data in one of the popular formats. Data from completed surveys are aggregated automatically after they are filled out. You can freely filter and segment the collected results. Cross answers to two questions with each other. See the presentation of the answer from a specific questionnaire, from a specific respondent. 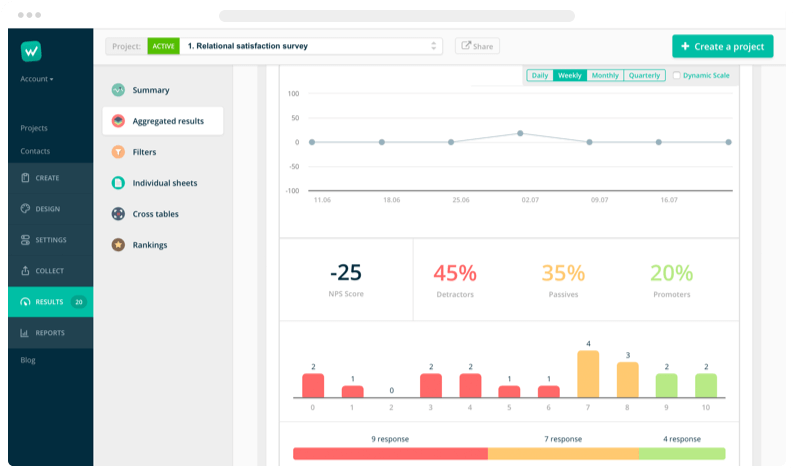 Determine what time and who will receive the automatically generated reports with summary or progress in the conducted research. At the set time, the report will be sent in the chosen form to the designated e-mail address. Do you need a report with a summary of the study? One click and it's ready. You can send such a report to your boss or colleagues, or archive it as research documentation. 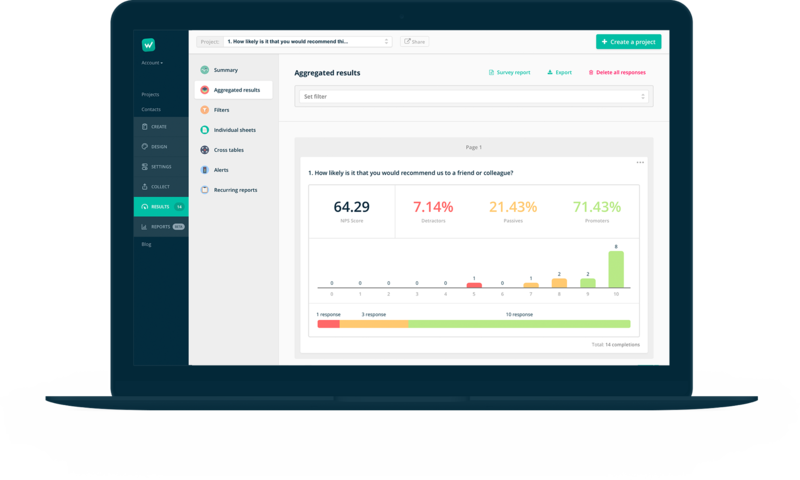 If you have a meeting and want to share the results, you can generate a summary presentation. Export collected data to Excel or SPSS, as aggregate or raw data, if you conduct advanced analysis and want to create pivot tables or combine completions with data from other sources. Thanks to alerts you will know about completions only when you want it. Alerts will allow you to send notifications about completing the survey only in specific cases. using our API or Webhook. and departments of large companies which is tailored to the needs of the most demanding customers.